Such excitement! 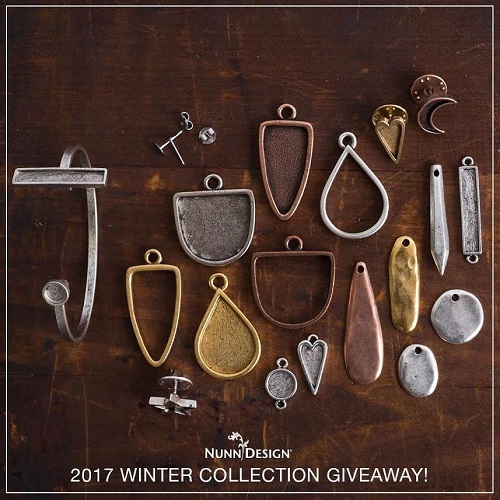 So many of you were wowed with this new Winter 2017 collection and giveaway by Nunn Design. The inspirational designs certainly got a lot of creative juices flowing. Violet Kiss said, "I do love Nunn Designs! Next best thing? Working with them!" Christine was so stoked when she said, "These are fabulous components! I have ideas for using every one of them!" A few of you also shared my liking for the minimalist bangle. We thank many of you who took the time to point out your favorites. This must surely help Becky Nunn so she can produce more in that line! Greta also raved, "Wow! This is an incredible collection. Who ever wins this one surely has a lot of fun in their future." They sure will. Unfortunately, there can be only one winner in what was a very popular contest. There should be no surprise why this giveaway received a lot of entries. I numbered all the eligible entries and got the random number generator over on random.org to do the picking. The incredibly lucky winner is : Mona of Bijoux Gems Joy. Congratulations! !